Comments: Used - Acceptable Hardcover. FINE BOOK, BUT IN ROUGH SHAPE. DAMAGE MAY INCLUDE WATER DAMAGE, TORN PAGES, SPINE WEAR, ETC? TEXTOOK ONLY; ACCESS CODES/CDS ARE NOT INCLUDED WITH USED BOOKS; AN ACCEPTABLE COPY FOR CLASSROOM USE! Not perfect, but still usable for class. Ships same or next day. Expedited shipping takes 2-3 business days; standard shipping takes 4-14 business days. "Evans approaches the history of ancient astronomy determined to enter the minds of those whose work he discusses, and in this, within his chosen limits, he is highly successful. 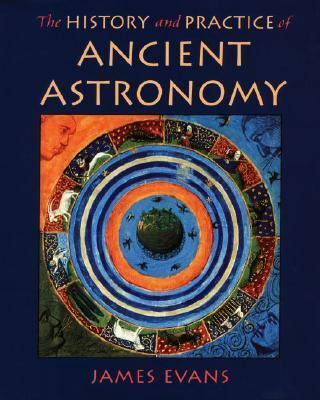 His is a hands-on approach eminently fitted to the needs of students who want to know not only what historians have said about an ancient astronomy, but also how astronomy was actually done in the past. "Evans, James is the author of 'History & Practice of Ancient Astronomy', published 1998 under ISBN 9780195095395 and ISBN 0195095391. Loading marketplace prices 12 copies from $40.76 How does the rental process work?